TPS is your source for ‘green’ eco-friendly solutions — certified disposable containers, tableware, and compostable packaging — made from renewable and sustainable bamboo products. TPS leads the way in green packaging products: disposable plates, bowls, cups and other compostable packaging – All stocked and ready for immediate shipment to food packagers and institutions across the country. Certified eco-friendly products at TPS… Quality you can trust! TPS offers exceptional service and reliable delivery of high quality modified atmosphere packaging products to food and produce packers and the food service industry. Call us today at (860) 644-6994 or email us to get the latest information on complete product lineup. 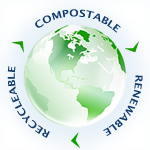 Total Packaging Solutions® provides green compostable products for the food service industries: Eco-Friendly disposable tableware, compostable plates and trays, disposable bowls and cups, disposable food containers, modified atmosphere packaging films, vacuum bags. Contact us about custom solutions.